DOW Great Stuff Pro foam sealants are closed-cell, single part polyurethane foams that expand and cure when they come in contact with air and moisture. Great Stuff sealants are used to fill smaller areas where air and moisture can flow including punch outs for plumbing and electrical, air spaces around windows and doors, sealing between panels and as a panel adhesive. 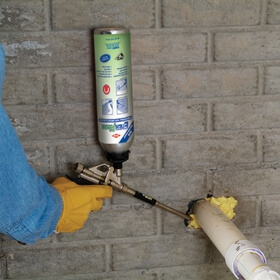 Great Stuff Pro Gaps & Cracks Fills gaps up to 3" forming a permanent, airtight and water-resistant bond. Acts as a fire block by sealing air passages that feed fires contained within walls. 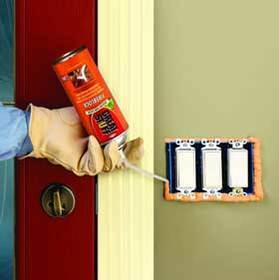 Great Stuff Pro Window & Door is a low expansion foam for use around window and door openings. Foam will expand to fill the space & not bow out window & door jams. Great Stuff Pestblock Fills voids and cracks where rodents and insects can enter your home. Specially formulated with a bitter ingredient. Great Stuff EnerFoam Combines the sealing qualities of low expanding foam with an added adhesive. Can be used for adhering insulated concrete forms, architectural foam, rigid insulation and drywall. Great Stuff Wall & Floor Adhesive A heavy-duty adhesive formulated to bond subﬂoors, drywall, paneling, foam panels and most construction materials. Bonds in a wide range of conditions including dry, damp and even frozen lumber.